[There is a] willingness to sacrifice large numbers of people in the way we respond to climate change – we are already showing a brutality in the face of climate change that I find really chilling. I don’t think we have the language to even describe [geoengineering], because we are with full knowledge deciding to allow cultures to die, to allow peoples to disappear. We have the ability to stop and we’re choosing not to. So I think the profound immorality and violence of that decision is not reflected in the language that we have. You see that we have these climate conventions where the African delegates are using words like “genocide,” and the European and North American delegates get very upset and defensive about this. The truth is that the UN definition of genocide is that it is the deliberate act to disappear and displace people. What the delegates representing the North are saying is that we are not doing this because we want you to disappear; we are doing this because we don’t care essentially. We don’t care if you disappear if we continue business-as-usual. That’s a side effect of collateral damage. Well, to the people that are actually facing the disappearance it doesn’t make a difference whether there is malice to it because it still could be prevented. And we’re choosing not to prevent it. I feel one of the crises that we’re facing is a crisis of language. We are not speaking about this with the language of urgency or mortality that the issue deserves. This has been called variations of victim blaming. Leaving aside whether the very-well paid executives of corporate-partnered environmental non-governmental organizations (ENGOs) are victims of much, it’s tossed about in several different manners. We are told that the people who are making the decisions about policy for such groups believe staunchly in the science, and are not in denial at all. Really? Saying you believe in the science is one thing. Having policy proposals that reflect the science is another thing. Having policy that reflects the science and calls for actions that can bring this about is a third point. And finally, having a policy that respect the science, proposes to do something about it, has an action plan for achieving this and can do so in a means that does not make those who are suffering climate effects also pay (in various manners) for its solution is yet another point. And the replacement for what is wrong and how we get there itself needs to be measured on its own merits– not how well it fits the economy. No one could possibly work in an environmental organization and not pay lip service to the science of climate change. It would be the equivalent of starting a new branch of Christianity and denying Jesus was the son of God. But is an official policy calling for the “stabilization” of the atmosphere at 450-550 ppm of carbon “realistic” to the science, or betrayal of science to embrace economic, capitalist logic? Well, to avoid picking on Environmental Defense, let’s mention that the NRDC, WWF, Nature Conservancy and many others now no longer adhere to the science. They have embraced a world view that has taken climate denialism and use it as cover for capitalist denialism, the denial that the problem has been apportioning off the earth, air, land, water and more into things to sell. Why? Because they no longer are concerned with an analysis of power, at least not such that they wish to challenge it. Criticism of corporate environmentalism of the most obvious variety, i.e., groups like WWF or EDF, is like shooting tofu while it’s still in the packaging. So let’s go a little further than that. Exactly. The problem is we need to see who are the liberals, and who are the conservatives. Or, to dust off the old jargon, we need to apply a class analysis. Within the green movements. Of who is who, in policy terms and outlook. How did it come to be, and where is it going. The reason we need to know this is straight forward: Many people want to do more than write a cheque for a group, they want to actively participate in the actualization of a vision of a world not threatened by climate change. So maybe people might want to decide if the outlook of the groups they are lending their time to is even remotely similar to their own beliefs. What we know is that the environmental movement had a series of dazzling victories in the late ’60s and in the ’70s[...]. It was just victory after victory after victory. And these were what came to be called “command-and-control” pieces of legislation. It was “don’t do that.” That substance is banned or tightly regulated. It was a top-down regulatory approach. And then it came to screeching halt when Reagan was elected. And he essentially waged war on the environmental movement very openly. It could have fought back and defended the values it stood for at that point, and tried to resist the steamroller that was neoliberalism in its early days. Or it could have adapted itself to this new reality, and changed itself to fit the rise of corporatist government. And it did the latter. There is a HUGE backstory that is missing here– or rather, a secret not being told. Around this time, the time of the advent of environmentalism being ascendant, certain American philanthropic foundations started a carrot approach to dealings with environmentalism. As has been detailed in the past by Jeffrey St Clair and Alex Cockburn, the first major foray into ruling class liberals hi-jacking policy for environmentalists on a large scale took place when the Pew Foundation began adding green groups to those applicants who could receive money to organize. This created and entrenched a Green elite. Soon, without having to organize or fund raise or otherwise work outside of their offices, they got well-paying jobs and started being invited to the right meetings, dinners, banquets and more. How have they stayed motivated? Does average wages of six figures a year, all travel costs, per diems, paid journeys to the far flung corners of the world to speak to other “green” experts or to hang around outside of the IPCC meetings not sound motivating? They have so much to lose, and the way to not lose it is to have policy proscriptions that can be amenable to the status quo– that is to power. Environmentalists are curiously the only people who are supposedly to act in the sphere of social justice who are supposed to never force but only persuade. And yet on climate, we are dealing with the largest and most powerful human forces in existence: energy corporations who are a part of the US military industrial complex. We can point out the obvious: Having the head of the David Suzuki Foundation also consulting for Shell Oil is like a peace activist consulting for the Marines– but what of groups ostensibly in opposition to the energy corporations? Is this an accurate reality, or is it a picture we have been given? Climate change organizing has received a lot more attention than where it was a few years ago. Despite the people who retort against the body of what Klein is saying, it is not the long hours these primarily white, well fed middle class people spent justifying to Dow Chemical that they need to call for 450-550 parts per million of carbon in the atmosphere (regardless of the fact such numbers are deadly to most life on the planet) that caused world attention to skyrocket. World events, and actual victims have changed the narrative. The crimes of Shell were elucidated to the world by the resistance of people, mainly indigenous, doing the day to day dying in the Niger Delta; the people giving them awards were the WWF. The crimes of fracking operators in the United States northeast were highlighted by farmers and ranchers who needed the water and noticed it was catching on fire and their skin was burning right off of their bones, the people telling us we need natural gas from fracking have been the NRDC. The destruction of the tar sands in Canada is most well known because of indigenous refusal to disappear from history to cancer and the destruction of their traditional forests; those who want us to work with Shell & Suncor run the David Suzuki Foundation. Klein then goes on to outline the history of the Green Groups jumping ship to embrace NAFTA, even when the non-staff public supporters of these groups said no. If this were the only bar to measure an organization, then her statement “It’s not every green group,” would be correct. Big Green for Nafta did not include the short list of exceptions she makes. However, she had outlined the far more important marker in her interview earlier of corporate-partnered outlooks. The part of the story that is missing (and it was just an interview) from her critique is the fundamental shift that took place in Green Groups that signed on to the pro NAFTA ENGO declarations. That shift had not involved Greenpeace nor the Sierra Club as yet; that has since taken place for both organizations. 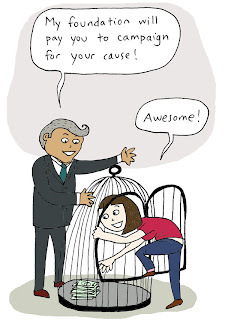 350.org not only is guilty of the approach, it owes its very existence to the fundamental shift– and that shift was towards authoritarian structures steered by non-group actors playing the role of sugar daddy. In the days before NAFTA was signed, The Pew Foundation had begun funding the Greens who ultimately agitated for the Free Trade Agreement; the pro-Democratic elite liberal foundations were all also wedded to Free Trade and the Clinton presidency. In other words, the base of decision making is now in the hands of those with capital. Small wonder that whatever the campaigns so devised call for it always avoids challenging the logic of capital dominance itself. Many people have picked apart the history of Greenpeace; entire books written on the subject don’t need to be revisited in a short article. Let’s just hit the highlights of the descent of Greenpeace in practice (not rhetoric) over the past few years, as giant foundations have laid control upon perhaps the most recognizable green group on the planet, in the very place it was born. There have been multiple deals and partnerships between Greenpeace Canada and corporations in the last couple of decades. In the Canadian Boreal Forest Agreement, Greenpeace not only signed a deal with 8 other green interests alongside nearly two dozen logging companies at the same time, but the announcements were a bit of a coming out party for the model of authoritarian capitalism taking the reins of green groups in Canada, much like Greens for NAFTA did in the United States almost 20 years before. The agreement was a (destruction of the vital) watershed moment. It was roundly condemned by First Nations community members for supposedly signing off on final status and use agreements without their consent. It was described by some experts as a farce, as it did not actually have scientific backing for many of the claims, leading to the creation of a “real CBFA map2” for circulation. Greenpeace has since left the agreement. They did not cite concerns over First Nations sovereignty, public democratic input or problematic forestry giveaways that had resulted from the deal. Indeed, the reasons the deal was scuttled by GP was stated as: “a lack of any tangible increase in permanent protection and conservation of the Boreal Forest,3” and not proceeding at a pace consistent with the agreements around protected areas and “sustainable logging practices” not yet being applied. “One interesting feature of the agreement here is with Greenpeace, David Suzuki, ForestEthics, Canadian Parks and Wilderness on our side– when someone else comes to try and bully us, the agreement actually requires that they come and work with us in repelling the attack and we’ll be able to say, ‘Fight me and fight my gang!’4” Brooks was then pointed at by Lazar. 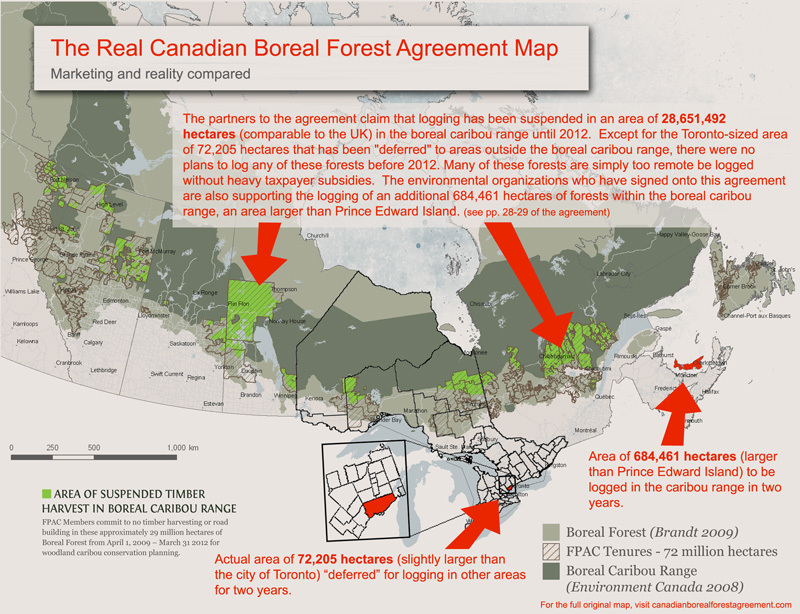 Lazar’s point was a signed legal agreement to not only not support member companies forestry practices, but defend the corporations to their shareholders if other parties complained. Let’s say a woman from a Cree community doesn’t want to see an area that is part of a tree farm license held by an FPAC company logged– both because it is sensitive for fish habitat and also traditionally sacred to her nation. Greenpeace agreed to then intervene on the side of the forestry company. That’s more than capitalism, but outright eco-colonialism. This same Brooks, still today working in forestry for Greenpeace (choice of words deliberate) has been given some rather remarkably blunt awards lately. He is currently feted (By GP itself) for winning the “Clean 50” award from “Delta Management” “corporate sustainability and clean technology search.” What’s that award for? “Honouring outstanding contributors to sustainable development and clean capitalism in Canada.”5 I swear I’m not making this stuff up. However, let’s go over a little bit about the groups also standing with Greenpeace and Brooks at that press conference. There are 9 groups identified as environmental organizations in total. There are uniting threads to these groups. Not one of them hold annual general meetings where policy is set by memberships, and a few of them aren’t actually Environmental NGO’s. This is the part of the story of the CBFA that seems to have been overlooked at the time. The Canadian Boreal Initiative is one that does not exist, except as a program from Ducks Unlimited (DU). Ducks Unlimited itself, while they may send you a neato calendar or whatever is the Christmas mailout this year, is primarily funded by US foundations, and gets it through a route that goes through the US wing of the same organization. DU Canada then spends money on a project called “Canadian Boreal Initiative” that does not have a society, board of directors or public mandate of any sort. The CBI is there to crush the notion of adversarial relations in the environment in favour of capitalist solutions in tandem with the most powerful corporations on the planet. The CBI advertises partnership with multiple industrial corporations, including Suncor, Canada’s largest energy company and original non-conglomerate tar sands developer. Further, Suncor was originally owned by Sunoco– and the founders (and still majority of the board) of the Pew Foundation // Charitable Trusts (and their splinter groups) also got their money from US big oil in their original endowment– today’s Sunoco. The CBFA marks the blurring of lines between all the various Green groups and fronts and foundations. The Pew Environment Group is directly funded by Pew, of course, but so are all the remaining groups. The bigger uniting Foundation, however, is Tides Canada. Immediately after the CBFA was announced, Tides Canada –formed as a legal entity separate from but related to the large US foundation, originally almost exclusively funded by none other than the Pew itself– began to work publicly extolling the agreement. Tides has gone into other areas as well, giving Greenpeace an award for the CBFA, citing the agreement as “showing the world how forest companies and environmental organizations can work together to secure a more sustainably managed Boreal Forest…”6 Tides also began to go public about Canadian tar sands organizing and other environmental issues. Backroom no more, the media treats them as just another group. Greenpeace is supposedly the one grouping on this list that doesn’t receive oodles of corporate funding, and comparatively speaking, that’s the case. However, Tides has now begun earmarking major financial contributions to Greenpeace for campaigns: Prior to now around the CBFA, but more often for the North American Tar Sands Coalition, currently run by former Greenpeace activist but now favourite of green capitalists, Tzeporah Berman. Now the rule has become this: If you have staff and are an environmental organization in North America, you are funded and directed by foundations who see “saving capitalism from itself” as the goal of environmentalism today. So what are we left with? Unfortunately, more of the same. South of the border, Bill McKibben’s outfit, 350.org, is a new face of this game. If only they were not. Bolivia, with its president Evo Morales, hosted a People’s Summit in April, 2010 to bring in social movements, governments and social justice advocates from around the world who were attempting to go beyond the capitalist (and industrial) framework that has handcuffed both negotiators and grassroots activists at the Intergovernmental Panel on Climate Change talks, supposedly designed to determine a framework to tackle climate globally. Almost all the major corrupt ENGOs were not there; however, 350.org was one of the invited groups and McKibben was a special guest. There were various peoples who wore 350 t-shirts and the like, positioning themselves as facilitators of various groups, and using that role to steer the conversation towards why people needed to adopt 350ppm as the goal. I want to avoid a long talk about the science– suffice to say the arguments were of “practicality”: “There is simply no way that one could (as of 3.5 years ago) call for 300ppm and get action from other governments to achieve this” to roughly paraphrase 350 interventions. In Cancun for follow up meetings of the IPCC on climate negotiations, Bolivia itself was made expendable with their proposals– by both other nation states but also by ENGOs. Since then, 350 has fared much better than the People’s Agreement of Cochabamba. In a recent piece8, I wrote a little on the history of 350 in the US. Suffice to say, they are now very well-funded, by the very same people who fund not just Big Green, but the very people in North America it is most deadly to hand direction of social justice struggles to: The US Democratic Party, especially the Hopey Changey variety of brand Obama. It has been noted for quite some time now that Obama didn’t save the people of Iraq, or the workers in their over-mortgaged homes. Instead, he saved the bankers and the industrialists who have created the mess in the first place, through giving a large segment of the population a reason to “trust” again, and handing over trillions of US Dollars to the richest people on the planet. Bill McKibben’s 350.org, Greenpeace and all the other green groups mentioned or alluded to in Klein’s original piece have performed the same role for capitalism inside the environmental movement. Giving people reason to trust structures and look to corporations as “partners” in solutions to the problems created by– corporate capitalism. At the end of her original interview, I have to say I agreed with Naomi Klein on the overwhelming bulk of what she said about the “Big Greens” and how they have (either by design or default) been better at creating complacency among climate activists and the population at large than the corporations. Who could possibly deny to themselves that oil or coal magnates have a rather vested interest in denying that climate change is as dire as the predictions of science? But what happens when the advocates of “climate action” propose actions that are doomed to failure, being wrapped in false economic logic, rather than demands that deny the right of capital first and foremost? Is the problem that we have gone so far down the “collaboration” model, the pro-capital model? The model where democratic decision making is an alien concept existing only outside of the environmental movement? It is excellent that this analysis is being re-fleshed out thanks to Naomi Klein making a few off the cuff remarks in an interview. What do we do when Greenpeace signs agreements to try and silence any environmental criticism of corporations they enjoy partnerships with? Who do we criticize if we have been forced into bed with the Obama administration and John Kerry? Finally, just a curiosity: Did not Naomi Klein herself join the 350.org board of directors awhile back9? Given her stated opinions on the corporate influence on ENGOs, it should be a great time to agitate for a new, democratic and honest movement: One that dares speak the name of capitalism, the creator of industrial climate change– and the failed corporate responses– today. Movements often have an organization that embodies their spirit. The US civil rights movement in the 1960s was driven forward by the Southern Christian Leadership Congress and theStudent Nonviolent Coordinating Committee (SNCC). The anti-nuclear direct action in the 1970s had the Movement for a New Society (MNS), and the "antiglobalization" movement of the 1990s and 2000s was an interwoven web of spokescouncil meetings and coalitions. Quebec's epic student strikes in 2005 and 2012 were initiated by the Association pour une solidarité syndicale étudiante (ASSÉ). It wasn't always this way. The environmental movement made far and away its largest gains before foundation funding entered on to the scene. Starting in the 1960s, environmental activism became an massive phenonenon, with 20 million people participating in Earth Day 1970. Hundreds of groups sprang up. Many of the larger ones, as Naomi Klein recently put it, had "elite roots." But grassroots, community-based groups came up with the most impressivevictories. A searing new report says the environmental movement is not winning and lays the blame squarely on the failed policies of environmental funders. The movement hasn't won any "significant policy changes at the federal level in the United States since the 1980s" because funders have favored top-down elite strategies and have neglected to support a robust grassroots infrastructure. Environmental funders spent a whopping $10 billion between 2000 and 2009 but achieved relatively little because they failed to underwrite grassroots groups that are essential for any large-scale change, the report says. Released in late February by the National Committee for Responsive Philanthropy, Cultivating the Grassroots http://www.ncrp.org was written by Sarah Hansen, who served as executive director of the Environmental Grantmakers Association from 1998 to 2005. The report makes the simple but profound argument that the current environmental funding strategy is not working and that, without targeting philanthropy at communities most impacted by environmental harms, the movement will continue to fail. "Our funding strategy is misaligned with the great perils our planet and environment face," Hansen writes. "Environmental activists and funders all share a gnawing sense that something has to change. No sensible environmental activist would argue that we, as a field, have done what is needed to respond to environmental degradation," Hansen said in an interview. Instead of funding community-based groups to generate ideas, strategies and political support for transformative change, environmental donors have thrown their weight behind narrow lobbying campaigns in Washington, D.C. -- for example, the failed inside-the-beltway campaign in 2009-2010 to pass "cap and trade" legislation to curb global warming. For their part, mainstream environmental groups hang pleas for environmental change on the apolitical hook of rational appeals, expecting that decision-makers confronted with powerful evidence will do the right thing. But this strategy has not worked because "a vocal, organized, sustained grassroots base is vital to achieving sustained change," the report asserts. "In movements throughout history, the core of leadership came from a nucleus of directly impacted or oppressed communities while also engaging a much broader range of justice-seeking supporters." In other words, successful movements for social change -- anti-slavery, women's suffrage, labor rights, and civil rights -- have always been inspired, energized, and led by those most directly affected. Yet these are the very groups within the environmental movement that are starved for funds. Analysis of environmental grantmaking, 2007-2009, reveals that only 15 percent of environmental grant dollars are classified as benefiting marginalized communities, and only 11 percent are classified as advancing "social justice" strategies, such as community organizing. The report makes a distinction between internet activism or getting your neighbor to sign a petition, and real community organizing. "Community organizing builds power by helping people understand the source of their social or political problems, connect with others facing the same challenges and, together, take action to win concrete change." Community organizing is messy and takes time. The report also distinguishes between "national organizations that might parachute into local communities for one-time policy campaigns versus authentic, local organizations that not only work on those same short- term campaigns but, just as importantly, build long-term leadership and capacity in the community to amplify change in the future." The report points out that the U.S. is growing racially and ethnically more diverse each year and by 2042 will be majority people of color. "New immigrants may come from countries with robust histories of social change movements that, combined with the increasing racial diversity of America's communities, provide an opportunity to diversify the ethnic composition of the environmental movement," the report says. And: "Unlike many of the professional advocates in Washington, D.C., people of color, immigrants, poor people and young people often are living face to face with the devastating impacts of environmental degradation. These growing communities have the self-interest to do something and, increasingly, the collective power to potentially make real change but may lack the support or resources to organize." "In this context, it is arguable that any push for environmental change which fails to prioritize communities of color is a losing strategy," the report says. And, "Until the broader concerns... of all communities are on the radar of environmentalists, it will be hard for environmentalists to be on the radar of all communities." In a stunning revelation, the report offers evidence that, compared to the average of all philanthropic donors, environmental funders avoid supporting disadvantaged people: "There is a seemingly contradictory correlation: analysis shows the greater a funder's commitment to the environment, the less likely it is to prioritize marginalized communities or advance social justice in its environmental grantmaking." The report offers a four-point roadmap for "funding the grassroots to win:"
Environmental funders should earmark somewhere between 20 and 50 percent of their total giving to underserved communities. Nearly half of all children in the United States today are black, Latino or Asian American and by 2042, a majority of Americans will be people of color. This is a powerful new constituency ready to take action on environmental issues, the report says. "Prioritizing funding for lower-income communities of color is not only strategic given that these communities are becoming the majority and support environmental change, but also because change that targets the most impacted populations has a multiplier effect for society as a whole," Hansen writes. Speaking directly to environmental funders, the report says, "We recommend that you allocate at least 25 percent of your grant dollars for social justice purposes, specifically with a focus on grassroots advocacy, organizing and civic engagement led by the communities most affected by environmental ills and climate change." "The way to build a broad movement around environment and climate solutions is to mobilize diverse communities of people around issues that are much closer to their self-interest (such as stopping toxic pollution, creating viable new jobs and reducing energy bills) and then work intentionally to connect those individuals and campaigns to a larger understanding of communal and global interests. Grassroots groups need resources to be able to engage effectively at all levels (local, state, national and international)." "Supporting grassroots organizing may require a paradigm shift in a foundation's grantmaking strategy. Depending on how your philanthropy currently supports grassroots organizations or does not, this can mean shedding expectations of microscopic, quick deliverables and embracing the slow, patient process of movement building. Legal work to overturn Jim Crow laws began in the early 1930s with Thurgood Marshall representing the NAACP lawsuits in Maryland. Imagine if early funders of the Civil Rights Movement had tried to "evaluate the impact" of their grants in the ensuing 20 years - before the popular movement took hold. Movement building takes time. "In his important monograph Just Another Emperor: The Myths and Realities of Philanthrocapitalism, former Ford Foundation director Michael Edwards cautions that one of the downsides of increasingly infusing the nonprofit world with business ideals is that social change organizations are expected to churn out good, quarterly metrics. Extreme advocates of these ideas expect social change organizations to report mounds of data and compete with one another for funding based on "numbers" and "deliverables." But on February 1, 1960, sitting at a "Whites Only" lunch counter at a Woolworth's in Greensboro, N.C., there were only four African American students from a local college. Although those may not appear to be impressive metrics, consider the scale and scope of the movement they helped launch." When I read that BC Federation of Labour President Jim Sinclair and Tom Sigurdson, head of the BC-Yukon Building Trades Council, had arrived at a deal with Premier Clark on training workers for the liquefied natural gas (LNG) business we’re told is coming, I couldn’t believe my eyes. Now let me make this clear – there is northing wrong and a lot right when traditional political foes shake hands on a deal that is beneficial to them or to the people of BC, or both. Way back in the 70s, Socred Labour Minister Allan Williams worked well with labour because there was trust. The question this latest deal raises is more fundamental than simply making a deal that may never happen, complete with photo-ops in which, I might say, Mr. Sinclair looked most uncomfortable. That this meeting kicks NDP Leader Adrian Dix right in the family jewels is obvious. Mr. Sinclair’s position goes way beyond NDP inner-politics and raises some interesting questions. In his remarks, Mr. Sinclair talked about his members “building things”, as a basis for supporting LNG. He then went out of his way to attack Dix for opposing for the proposed Kinder Morgan pipeline expansion to Vancouver. Let’s look at a couple of issues that make me think Mr. Sinclair is for anything that can be built. What if, as I believe (and I’m not alone), no LNG plant goes ahead? Apart from the fact that he will have a lot of fences to mend with his own members, Mr. Sinclair will be tied to a failure. What evidence does he have about what an LNG pipelines and plants will do environmentally? If Mr. Sinclair doesn’t give a damn and his position is simply an attack on Mr. Dix, that’s one thing – but if he believes some LNG pipelines and plants will be built, surely his members and the public-at-large should know about these fatcors. According to Bloomberg, the Asian price for LNG should collapse to the point where we’re actually losing money – right about the time we enter the market. Apart from LNG pipeline builders, who will mostly come from outside BC, and a few non-union white-collar jobs at the plant, where are the jobs for British Columbians? For an LNG pipeline and plant to make sense, one must know what market there will be years ahead, when the plants are finally operational. If there are firm deals made – and open to public scrutiny – we must know what the price will be five years down the road. Incidentally, according to Bloomberg, using the best data available, the Asian price for LNG should collapse to the point where we’re actually losing money, right about the time we enter the market. What if the LNG entrepreneur wants to bring his regular crew in to construct the project? Is it Mr. Sinclair’s position that they can be barred to make way for local workers? Has Premier Clark guaranteed this? In advance of any action on the project? Mr. Sinclair makes it pretty clear that he’s not concerned about the environment – if there’s something to be built, then let’s build it. He’s given his blessing for LNG projects before most of the dozen or so proposed have gone through environmental assessment of the plants or the pipelines associated with them. And that’s saying nothing of the controversial practice of hydraulic fracturing (fracking), which would supply these pipelines and plants. Let’s look at the last piece. Environmental concerns are not piddling matters. Fracking involves deep drilling then using huge quantities of chemically-laced water. Where does that water come from? Where does it go? What about the stability of the ground around the extraction? I infer from your comments, Mr. Sinclair, that you approve of the new Kinder Morgan pipeline and the Enbridge pipeline. I realize that you’re from Ontario and thus not as concerned about the beauty of this province as natives are. So are you saying that ”building” trumps environmental concerns? Surely, you don’t insult the intelligence of the public by saying that Government/Industryenvironmental processes actually work! We know, for example, that Natural Resources Minister Joe Oliver and our Prime Minister have said that the Enbridge Pipeline will go ahead regardless of the findings of the Joint Review Panel hearings. What you say, Mr. Sinclair, whether you think so or not, is that all members of the BC Federation of Labour must support LNG, the Enbridge pipeline and the Kinder Morgan expansion. The thousands of British Columbians who have strong environmental concerns must, if they are union members, change their evil ways and all get behind whatever project will allegedly get them jobs. To meet with the government and try to get a good deal for your members is a very good idea, unless you’ve been played for a fool – which you just have been. "The truth is that our future prosperity depends on integrating sustainability as a key driver of our province’s economic development. B.C. needs bold and purposeful policy and action to meet the biggest challenge of our time: climate change. Failure to act will be immensely costly to our ecology and our economy." I asked [Tsleil-Waututh elder] Amy George if she would be participating in British Columbia Truth and Reconciliation Week herself, and she said that Kinder Morgan is a corporate sponsor of the event and that corrupts the entire effort and she won't have anything to do with it. From September 18-21, 2013, the 'Truth and Reconciliation Commission' (TRC) is holding an event in British Columbia as part of its Canada-wide effort “to promote awareness and public education about the Residential School system and its impacts". Simultaneously a fairly new organization named 'Reconciliation Canada' is organizing some events of its own to coincide with TRC's event in BC. These events include a "Reconciliation Walk" and an "All Nations Canoe Gathering". It is not widely known or reported that the TRC's BC Event is sponsored by none other than the American energy company Kinder Morgan. This curious little fact is quietly tucked away on their website for the event under "Acknowledgements". In addition to Kinder Morgan sponsoring the Truth and Reconciliation event, Reconciliation Canada (organizers behind Reconciliation Week) has a curious sponsor of its own: Canadian energy company TransCanada. They are listed as "Bronze Sponsors" on Reconciliation Canada’s website. 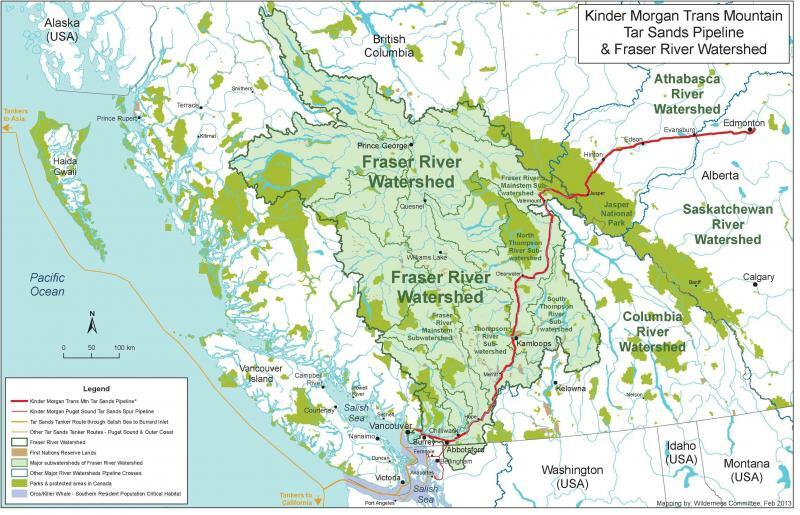 Kinder Morgan is an American energy company based in Texas seeking to build a new Tar Sands pipeline from Calgary to Vancouver to ship Tar Sands oil to China, directly putting rivers, waters, and our way of life at extreme risk. They currently own and operate a pipeline port that was built in 1952 primarily for domestic consumption; the new pipeline will be used exclusively for international export. To be more specific, Kinder Morgan’s pipeline is seeking to carry up to 890,000 barrels of oil products per day traveling across nearly 800 km of BC and Alberta. Imagine it: Kinder Morgan’s operation would expand from the current 70,000 barrels per day to 660,000 barrels per day being exported in oil tankers. Seventy-seven thousand to six hundred and sixty thousand! This would increase the number of tankers they use each year from 80 to 420--each one carrying three times the amount of oil that was spilled by the Exxon Valdez. 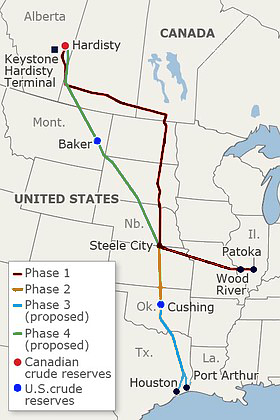 TransCanada is the energy company that seeks to build the Keystone XL Pipeline from Alberta to the Gulf Coast. This pipeline has faced huge opposition from Indigenous peoples along its route, along with environmentalists and many other concerned Canadians and Americans for the sheer environmental risk. Greenhouse gases emissions alone would exceed that of more than 4.6 million cars! 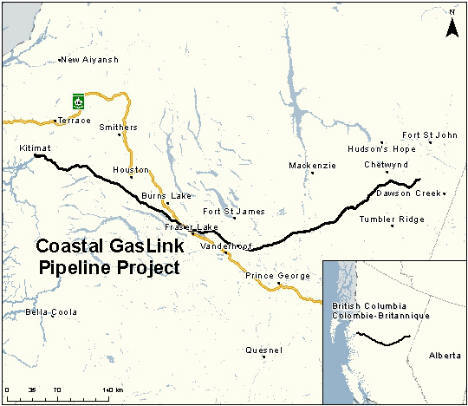 In addition to the Keystone XL, TransCanada is seeking to build the Coastal GasLink Pipeline from Alberta to the BC Coast; again, threatening the environment and livelihood of Indigenous people along the route. I am a Sḵwx̱wú7mesh (Squamish) community organizer. I come from the territory where the main port for Kinder Morgan’s pipeline exists and plans to be built. The increased oil tanker traffic will travel through my peoples waters to ship raw bitumen to China. As a community that will be directly impacted by these plans and a descendant of Residential School survivors (having lived the inter-generational trauma from Residential Schools), I feel the issue of Big Oil sponsoring Reconciliation is an important issue that needs to be raised. Big Oil companies such as Kinder Morgan and TransCanada use events such as this (particularly Indigenous organized events) to improve their public image in the face of opposition from Indigenous peoples and their allies. It gives them an opportunity to say, for example, "We support Aboriginal peoples by… giving sponsorship to these events, scholarships, foundations." I hope I don't need to remind you that our Indigenous brothers and sisters up in the north and in the east are working extremely hard to prevent these pipelines from being built. In my community, we may not live with the direct impacts of an Oil Sand factory next to our reserve, or Liquified Natural Gas plants in our sacred 'Spirit Places' -- but this is what Indigenous communities are resisting in many places. I felt it important to share this information in the hopes that we discuss the problem of accepting funding from such morally corrupt institutions. In no way do I wish to diminish the work of those involved in either of these events or the opportunity to have Residential Schools survivors participate in something meaningful that brings healing to them and their families. But accepting this funding is an issue that cannot be unnoticed or unaddressed. If it is acceptable here and now, it will be acceptable in the future for other organizations. In short: it sets a precedent. The big question is: Are we willing to walk our talk? Will we stand by our principles in opposition to destructive pipelines, oil sands, fracking, and companies that are attempting to increase these activities? Saying "No" may feel like a negative thing to say sometimes, but in other ways it is an empowering, uplifting, and strengthening act. In this case, it also means we are saying “Yes” to our cultures, lands, and ways of life. As well-intentioned as funneling money out of the savage beast is, I can't in good faith see it anything but a tactic by our enemies to win. History of course repeats itself. It is a proven tactic. In the late 1800s, the Catholic Church would start a mission to Christianize and convert my people. They began by offering gifts to prominent Sḵwx̱wú7mesh leaders to raise their stature and prominence. These leaders would be seen as special in the eyes of the Church. It would make these leaders more able, and more likely, to assist with converting the populace. After using these converted leaders to assist in converting the people to Christianity, they slowly segregated the people to the confines of reserve boundaries. By the time there was a mass influx of European and Asian settlers, the reserve boundaries were cemented in the minds of the people, enabling a massive theft and destruction of our lands. Where are those gifts and where is the land? Perhaps, 100 years from now, some of our descendants will talk about how these Big Oil companies offered gifts to select events, groups, and leaders, and how they in 100 years will have nothing to show for it. As Indigenous people we live a life of paradox and contradiction. Our struggle for justice is to undo some of these contradictions. I understand not everything is black and white; but some things can be very simple. Out of all the choices we are given by government or destructive companies, will we accept their financial assistance thereby supporting their destructive agenda? This is one choice we have complete control over. All we have to do is say “No”. Khelsilem Rivers is a Sḵwx̱wú7mesh-Kwakwa̱ka̱’wakw community organizer from Vancouver, British Columbia. He has worked for a number of years on decolonization and language reclamation supporting the resurgence of Indigenous peoples around principles of justice, freedom, and liberation.